With one look, he was transported to the past. The heat, the dust of the road and the feeling of being lost rushed back to him. Nights spent in roadside dives, the muffled sounds of his mother’s tears, as they made their way to a new life on the west coast. Hope for work, no guarantees, but a new life nonetheless. He looks across the 60 years since that migration, the truck no longer a time machine, but a rusty reminder of where he’d been. I like this. It has a lot of character. It struck me as a little sad at first, but then I realized–the guy is reminiscent, so he must have ‘made it.’ However, I doubt it was easy. Good preface to a powerful story-to-be. I’m in agreement… sounds like the opening chapter of a book… nice. I loved this–nostalgic but with strength and accomplishment. I agree with Lora that it has a “taste” of The Grapes of Wrath. I especially enjoy this type of story where great odds are overcome for a better life. Beautifully done! Wistful, nostalgic – loved it. It’s amazing how you can convey the struggle with a few word. A simple, powerful look into a turbulent past. You really breathed life into this week’s prompt. Well done. I agree with the others about the feel of “The Grapes of Wrath”. Sort of like Tom surviving and coming home a second time and this time finding nothing at all and left with only his memories of the last 40 years. Very nice. Nice details. “Rusty reminder” is poetic. This is a very powerful story. Funny how something like an old, rusty truck can pull out such deeply emotional memories, but the oddest things can sometimes trigger the best (and the worst) memories. Love the comparison of the truck to a time machine. A good take on the prompt Erin. A “Grapes of Wrath” flashback. I liked it! Thanks for the feedback. I see the Grapes of Wrath theme, but I was really drawing this from my father’s experience of leaving Ohio with his mom and step dad and heading to Californis in the mid 40s. He saw a car that was like the one they drove across the country in and it really unleashed some memories for him. I guess when you think about it,it pretty much was a grapes of wrath parallel. 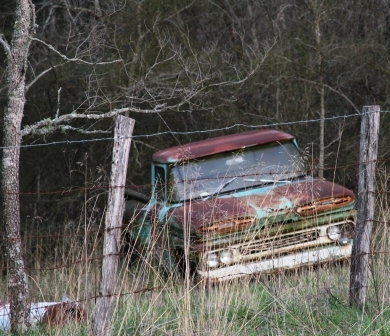 The old truck seemed to be telling me some stories of where it had been.I enjoyed the prompt. An emotional and moving piece. Well done. I love it! Really great imagery and really well put together. Can’t wait to see what you come up with next week! another word may ruin it…so, take my first line! Really like the imagery and idea of it. Your story packs a lot of punch in such a few words. I loved the part where he thinks of the past while looking toward the future. I liked the nostalgia of this piece. It’s amazing how emotional people are over vehicles and the memories they can evoke. A lovely look at how something as simple as a battered old truck can evoke such strong memories. Good stuff! I also loved the time machine reference, but felt like it *did* transport him in time back to the past for a little while, even if he didn’t realize it. I connected with your writing, partly because it is very good and partly because I saw your dad in it. Nicely done. I also agree that it make a good opening bit to a larger story but it stands alone very, very well.